Because really everything is possible! 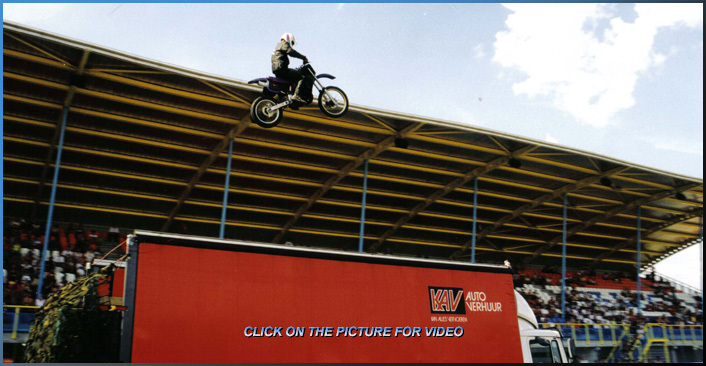 A far and high motorcycle jump with a landing in the back of a fast moving truck. The Catch & Carry stunt! A large, very high, ramp is placed in the centre of the stunt arena. From a distance a truck and a motorcycle approach at full speed. The big heavy truck with the relatively small motorcycle give a very nice 'David and Goliath' effect. When they arrive at the ramp, the motorcycle uses it to become air born. Extreme air born! The truck uses the time of the motorcycle's flight to manoeuvre into the motorcyclist's patch. The motorcycle lands safely in the boxes in the back of the truck. A truck that drives more than 70 km per hour travels 20 meters per second. With a 10 meter landing spot in the back of the truck, the truck is only half a second on the spot where the motorcycle will land. That makes the timing of this stunt extremely difficult and will make your audience watch the stunt full disbelief. And that is with good reason; Dantes Stunts is the only company in the world that offers this stunt for events.